Please Help us Welcome Chef Tom! Chef Tom is a 1999 graduate of Sullivan University in Louisville Kentucky. While attending Sullivan he had the honor to be part of the distinguished team that was chosen to prepare Mother’s Day Brunch at The James Beard House. Upon graduation, Chef Tom became executive chef of Brasserie Dietrich’s where he gained valuable skills that laid the foundation for his career. After leaving Louisville, Chef Tom took a sous chef position at Hemingway’s Restaurant a Mobil 4-Star and Fine Dining Hall of Fame restaurant in Killington, VT. While at Hemingway’s Chef Tom had another great honor: preparing a birthday dinner for Chef Julia Child, and—perhaps even more exciting—the chance to meet her as well. In 2001, Chef Tom began working in Indianapolis where he plied his trade at some of Indy’s finest restaurants including: Something Different another Fine Dining Hall of Fame restaurant. His last stop in Indy was the Chef de Cuisine at Oakley’s Bistro— winner of Indy’s Best Restaurant 3 of the 4 years he was at the helm. It was in Indy that he competed in the Indiana Pork Producers “Taste of Elegance” competition, winning once and placing second nationally in the two years he took part in the event. In 2007, Chef Tom started down another career path, focusing on foodservice marketing. This expanded new role has given him the opportunity to work with some of the largest manufacturers and operators in the business, including Mission Foods, National Pork Board, Torani, Lamb Weston, Nestle Foodservice, Otis Spunkmeyer, Tyson, Bama Foods, Splenda, Bush’s Beans, Checkers/Rally’s and other Top 200 chain operations. 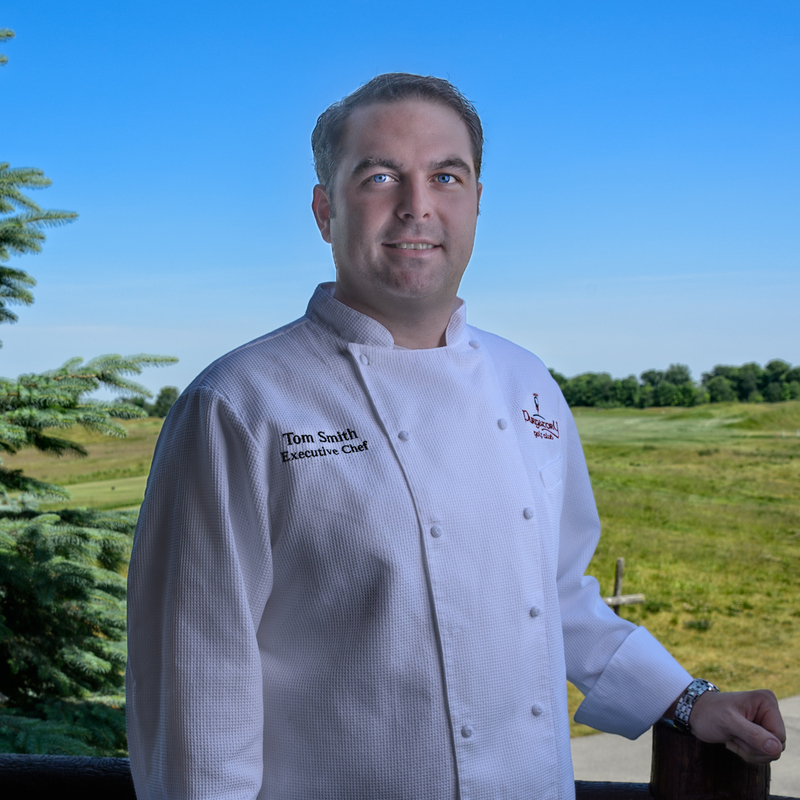 Beginning in May of this year Chef Tom is proud to become the Executive Chef of Purgatory Golf Club. He is looking forward to the opportunity to work with the staff at Purgatory Golf Club and provide a high-level food and beverage experience for golfers, weddings and business meetings at Purgatory Golf Club.